Each Sunday service is broadcast on WTND, 106.3 fm, at 5 pm on Sundays or streaming at wtnd.org. The Rev. 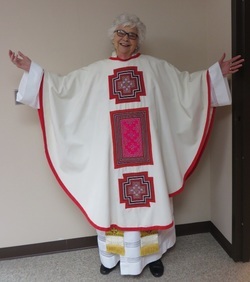 Paula Engelhorn is our priest. On December 2, Violet and Chad, children of Rebecca Peterson and grandchildren of Tina Lantz, were baptized by The Rev. Paula Engelhorn. In spite of frigid, icy weather on January 24th, we held a concert by our wonderful WIU quartet at the Wesley Village Community Center. Thirty-nine hardy souls enjoyed the pops music played by Vlad Hontilă, violinist; Erik Ghukasyan, violinist; Maria Angelica Gonzalez Iraheta, violist; and Nathalie Hernandez-Ayala, cellist. Afterwards we served desserts and drinks. The event raised over $900 for our music scholarships.